Perspective is everything. While watching “Army” (1944), the fourth title in this Eclipse set of director Keisuke Kinoshita's World War II-era films, I couldn't help but being put off by what seemed to be the film's incessant drumbeat for war. Beginning in 1865 and accelerating to the present, “Army” depicts Japan as the aggrieved party nobly seeking revenge against a century-long conspiracy of Russians, British, Chinese, and American forces. A character who briefly speculates that, if not for good fortune, Japan might have lost a previous battle is immediately castigated for his lack of patriotism; Japan always wins because it is divinely predestined to do so. 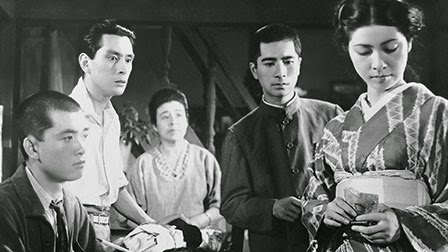 A few generations of patriarchs (including Ozu superstar Chishu Ryu) in the film's central family want only for their sons to grow up strong and brave enough to die in the name of the emperor because there can be no greater honor. It was somewhat eye-opening then to read Michael Koresky's excellent accompanying liner notes in which he explains that the film's debut was considered scandalous in some quarters and that one army general branded Kinoshita a traitor. 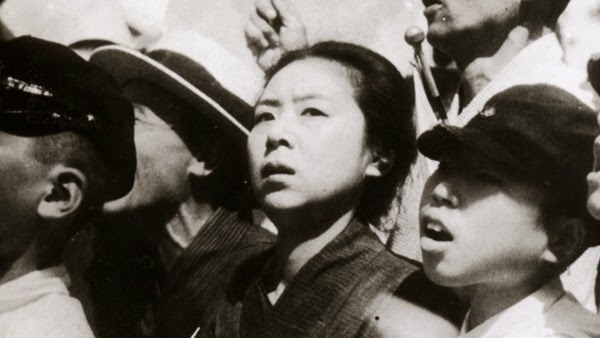 The baffling charge centered on the film's climactic scene which dares to depict a mother (the remarkable Kinuyo Tanaka, who later become one of very few Japanese women to direct films in the '50s) profoundly terrified by the sight of her son marching off to war. I guess she was supposed to be jumping up and down with joy at the honor. 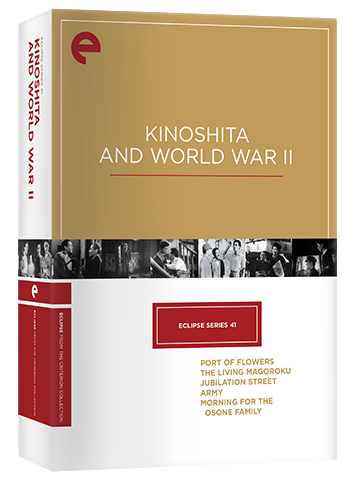 Koresky argues that the scene reflects the complexity of Kinoshita's moral vision even while working under the restrictions of war-time censorship. That's undoubtedly true, but Kinoshita certainly did his share of flag-waving in the first four films included in this set. One of the (unsurprising) lessons gleaned from this collection is that propaganda is universal. If American viewers are somewhat disturbed by the sight of the characters in “Port of Flowers” (1943), Kinoshita's debut feature, roundly cheering the announcement of the attack on Pearl Harbor, keep in mind that in America a smiling Superman was encouraging young readers to “slap a Jap.” Kinoshita's first film is actually a patriotic soft-sell revolving around a plot by a couple of city slickers to con a village of country yokels. A phony business plan involving a local shipyard inadvertently becomes a crucial element in Japan's newest war effort and the bad guys are strongly encouraged to have a change of heart and join the national project. That's the theme that unites the first four films in the set: put aside your personal agendas and work together for national defense. Superman wanted everyone to buy war bonds too, didn't he? “The Living Magoruku” (1943) provides a dramatic variation on the first film's comic take. In order to honor their warrior ancestors, the Onagi family has left a large plot of land undeveloped for centuries, but now they are called upon to open the field for crops needed to feed the wartime populace. The younger villagers insist on the need for change while the older Onagis resist in the name of tradition, making for a delicate balance in the narrative: some old traditions must make way to support the new order which, itself, claims the justification of millennia of tradition. Duty to ancestors remains paramount, but families must now learn to think collectively, not just in terms of a single bloodline. “Jubilation Street” (1944) is very much of a piece with the British homefront films of WWII like Powell and Pressburger's “A Canterbury Tale.” Tokyo residents are asked to maintain a stiff upper lip just like Londoners and the story focuses on the travails of one tiny neighborhood in Tokyo that is forced to relocate because of the war. Multi-generational businesses must close or shift production to support the wartime effort, and even crotchety old men very set in their ways must acquiesce to changing conditions. The film restricts itself almost entirely to a single street yet explores its tight spaces to tell the story of an entire nation and, by extension, much of the world. Kinoshita's alleged offense in “Army” shut him down for the duration of the war which only meant waiting a little more than a year until he made his first movie under guidelines set down by the occupation forces. “Morning for the Osone Family” (1946) represents a startling sea change from the other films in this set. The two eldest sons of the title family express their opposition to the war repeatedly and are persecuted by government officials for their principles, either imprisoned or forced into service. A domineering uncle tries to take over for his deceased brother as family patriarch but the army general's abusive nature comes to serve as a stand in for the military hubris that doomed Japan. Blame is placed exclusively on the belligerence of the entrenched military powers with the civilian populace depicted as victims rather than enablers. The most positive take situates Kinoshita as finally being in a position to express his true feelings, though it's reasonable to wonder if his abrupt shift suggests he was willing to do whatever was necessary to keep working under either regime. The director's accomplished and sensitive post-war career argues for the former. The camera work in all five films (with Hiroshi Kusuda as cinematographer on all but “Army”) is unobtrusive but still remarkably deft at observing an array of characters who, even while eagerly joining the national effort, have distinct personalities, fears and desires. Even supporting characters are given sufficient attention and nuance to avoid serving as mere stereotypes or narrative placeholders and that may be this quality that most distinguishes and unifies these films. These spaces and the characters inhabiting them feel authentic, perhaps enough so that you dare to hope these sophisticated people don't really swallow the rhetoric being spewed, but rather endure it. It's been a while since we've had an Eclipse release. In case you forgot, this is Criterion's no-frills sub-label which usually features unrestored transfers. The quality varies wildly among the five films in this set. “Port of Flowers” shows extensive damage and deterioration both in image and sound; the hollow, distant voices sound like they come from a separate radio broadcast. “Jubilation Street” has some very rough patches as well, particularly with a sound track occasionally overwhelmed by static. “Morning” shows a lot of scratches and some staining as well though sound is acceptable. “Magoroku” fares somewhat better though there are intermittent registration issues and variable brightness levels within shots; much better sound though. “Army” has plenty of scratches and other damage as well but the quality is consistent enough that it's not too distracting. Missing frames abound through the set, but no doubt all of the problems are attributable to the source prints. For the most part the actual sharpness of the image is pretty good throughout aside from the occasional soft scene and that's really the most important thing. The audio problems are a bigger drawback than the image concerns. This will be the worst audio quality you've heard from Criterion/Eclipse in quite some time. Fortunately optional English subtitles support the Japanese audio but there are times you might want to just turn down the volume a bit when the static becomes too much to take. This is Eclipse so no extras, but we do get liner notes from Michael Koresky on each film. His clear, informed writing has been a major asset to Eclipse releases for some time now and that's once again the case with this set. 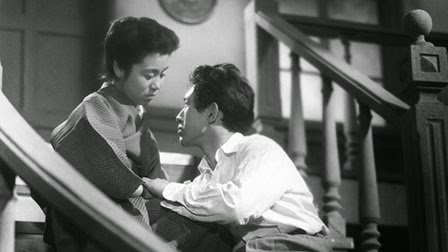 Keisuke Kinoshita is best known in the States for “The Ballad of Narayama” (1958) and “Twenty-Four Eyes” (1954), both of which are also included in the Criterion Collection. The release of these early films by the Eclipse set will go a long way to broadening appreciation of a director whose profile outside of Japan deserves to be expanded. It's always fascinating to see the war time propaganda of countries you are less familiar with; it is simultaneously comforting and dispiriting to see just how much American and Japanese war films are alike. I'd still take “Narayama” and “Twenty-Four Eyes” over any of these early works, but each of the films in the set is quite compelling. Let's hope there are many more Kinoshita films on the way.